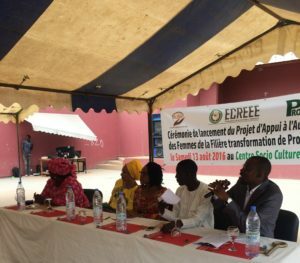 On 13 August 2016, the ECOWAS Women’s Business Fund Project in Senegal, known as Autonomisation Economique des Femmes de la Filière Transformation de Produits Halieutiques (PAAEF) was commissioned and the project officially transferred to the beneficiaries, i.e. the women fish producers in Bargny, Senegal. Implemented by Action Solidaire Pour Une Afrique Nourriciere, the project is one of the beneficiaries of the pilot phase of the ECOWAS Women’s Business Fund Initiative which was launched in 2014, in the framework of the ECOWAS Programme on Gender Mainstreaming in Energy Access (ECOW-GEN). 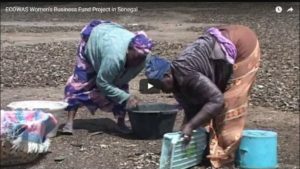 Targeting the fishery sector, the Women’s Business Fund project in Senegal aims at modernizing the method of drying and processing fish in that community. Seven fixed furnaces (of dimension 6m x 1.4m each) were built and a revolving micro-credit fund was established to support women groups in accessing funds. Further to this, the women received training on financial and business management as well as on environmental management. The project has worked to improve women’s welfare and productivity – with clean and modern energy technologies available to the women of Bargny, time spent on drying fish has fallen from 24 hours to 6 hours. Moreover these women can now conduct their business in a cleaner and healthier working environment. Benefiting 300 women, the project has well exceeded expectations, producing both immediate and long-term social, economic and environmental impacts. Through this single project, we have seen an improvement in women’s voice and agency in Bargny, Senegal. See “Why we sponsor community driven projects” for full details of the benefits being realized through this project. The ECOWAS Women’s Business Fund initiative was established to specifically address challenges related to women’s lack of access to finances, by directly providing women entrepreneurs (or indirectly through project promoters) financial and technical support to start-up and/or scale-up innovative energy businesses across the region. With seed funding from the Austrian Development Cooperation (ADC) and the Spanish Agency for International Cooperation and Development (AECID), the initiative works to harness women’s intelligence and creativity to empower themselves economically, contribute to improving energy access and to the development of their community. Incorporating project activities designed to result in an increased level of innovativeness, creativity and the decision-making capacity of women beneficiaries. This approach to community project development has proved to enhance a project’s attractiveness as the PAAEF project has attracted new partners and additional funding from UN Women in Senegal, PROGEDE II and ANER to support the replication of similar projects in other rural fishing communities in Senegal. The representative of the ECOWAS Centre for Renewable Energy and Energy Efficiency (ECREEE), Ms. Monica Maduekwe, in her message directed to the women beneficiaries, noted that “the financial contribution made through this project is an ECOWAS, ADC and AECID investment, and investments have to be profitable”. She explained that the mark of how profitable this project is will depend on how the women continue to use this support to transform their lives in the long-term. Adding that “we will be watching to see if these women are able to continue what we have started”.